Visit Wendy-Lou Haird at her charming home in Rolling Hills Country Club in Prestondale, and you’re immediately surrounded by little touches of creativity. The small, lush garden is beautifully tended indicative of hours of hard work. Indoors there are artfully arranged flowers, intricate tapestries and the like, while hand-crafted clocks (made by husband Barry) chime gently in the background. Forever busy with her hands, this is the energetic 79-year-old’s latest project, and one she says is particularly close to her heart. “In April this year, my daughter Cindy-Lou arrived with a basket full of odd socks which had piled up over the years – some of which had belonged to my grandchildren from when they were small. “We have a family motto: ‘If we can make it, don’t buy it’, so I gave some thought as to what could be done with them. I had in fact seen toys made out of socks some time ago and decided to have a go at creating a few dolls,” she explains. Wendy-Lou’s skilled craftwork has won prizes at The Royal Show in Pietermaritzburg, so “sock craft” certainly had some interesting possibilities. Holding one of the dolls, Wendy-Lou demonstrates how the toys are put together, using stuffing from old cushions, fabric scraps, and so on. “Everything is recycled, nothing is purchased. Even the doll’s (somewhat frizzy) hair is made from frayed mohair fabric. “This one is having a bad hair day,” she quips. 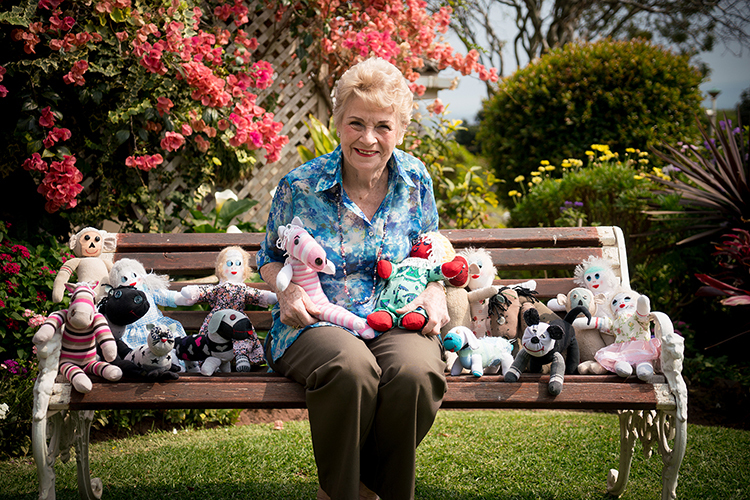 Friends soon started dropping off their odd socks, and before she had even started on the first sock, Wendy-Lou had decided exactly where the toys were destined for – a remote village in the Transkei for a special group of children. The family do as much as they can for the surrounding community when they are at the cottage. Last Christmas Wendy-Lou made 100 bags from fabric samples and filled them with food items and other little hand-made treats, distributing them among the elderly. At the time of going to press, 70 sock toys were being carefully packed, ready for the long journey to the Transkei, soon to be delivered to the children in the local school. “I can’t wait to see their little faces,” said Wendy-Lou, her face alight with anticipation.